A consortium led by Sir Richard Branson's Virgin Group has put forward plans to take control of Northern Rock. Under the plans, Northern Rock would keep its stock market listing but would be rebranded as Virgin Money. Sir Richard has put together a consortium of US and Asian investors, including insurance firm AIG, to take a majority stake in the troubled bank. Its plan would inject substantial funds into the bank and "guarantee" the jobs of most of its 6,000 staff, he added. 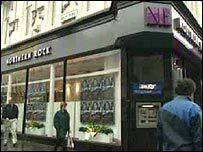 Northern Rock's shares, which have plummeted in value in the past six weeks, closed up 5.9% at 273.25p following Virgin's announcement. Virgin said its proposal was the "quickest possible solution" to restore public confidence in Northern Rock, which was severely undermined when it sought emergency funding from the Bank of England last month. Virgin said its consortium was not looking to buy Northern Rock but that it would inject "hundreds of millions of pounds" in return for a substantial stake. It is also looking to buy newly-issued shares at a discount to their current price. Virgin added that it would keep the Northern Rock business intact and retain its links with its charitable arm, the Northern Rock Foundation. Should the deal go ahead, the business would be run by Jayne-Anne Gadhia, head of Virgin's financial services business, who has been working with Sir Richard on developing a mortgage business for him. Virgin's proposed partners include US insurance giant AIG, buyout business WL Ross and Hong-Kong based investment firm First Eastern Investment. Virgin said Northern Rock needed a "complete rebranding" and that it believed the business could prosper from an association with the Virgin brand. He wouldn't say how much money Virgin was putting into the deal. "I have pulled together a heavy-hitting consortium that we believe has not only the knowledge and expertise but the financial clout to make a once great British institution great again," Sir Richard said. The Virgin tycoon said Northern Rock was a "fundamentally good business" but that its most senior executives had made mistakes and should be willing "to fall on their swords". BBC business editor Robert Peston warned that any deal would be dependent on the government continuing to financially support Northern Rock. "There are, of course, big obstacles, not least of which is that Northern Rock has now borrowed £13bn in emergency funds from the Bank of England - with the loans underwritten by the Treasury - and all of that would have to be refinanced by any successful bidder," he says. Refinancing the loan in current market conditions would be "too difficult" for any buyer should Treasury support be withdrawn immediately on completion of the deal. But Sir Richard insisted that the consortium's business plan would ensure that the public money would be recouped. Virgin's move could also face competition from a number of possible rival suitors. Reports have suggested US private equity group JC Flowers has set aside £15bn ($30.6bn) to buy the bank. Further speculation also suggests that JC Flowers and rival Cerberus are planning to break up the firm and buy its lucrative home loan book. Meanwhile, hedge funds SRM Global and RAB Capital have taken stakes in the firm, fanning hopes that the business may be taken over as a going concern. Northern Rock ran into trouble last month when it faced a liquidity crisis as a result of the global credit crunch - which began in the US. Northern Rock was particularly hard-hit because it borrows an unusually large proportion of the money it lends to homebuyers from other banks. The Virgin group pushed into the financial services sector in 1995 and now offers credit cards, insurance, savings and pensions.